The market for drugs and vaccines to combat infectious diseases is expanding overall, but with wide variation in sales among its segments. This article analyzes the products, trends and dealmaking underlying these changes. Two contrasting trends are apparent in the infectious disease market. On one hand, the market has witnessed unprecedented growth in the antiviral and vaccine areas since 2010. 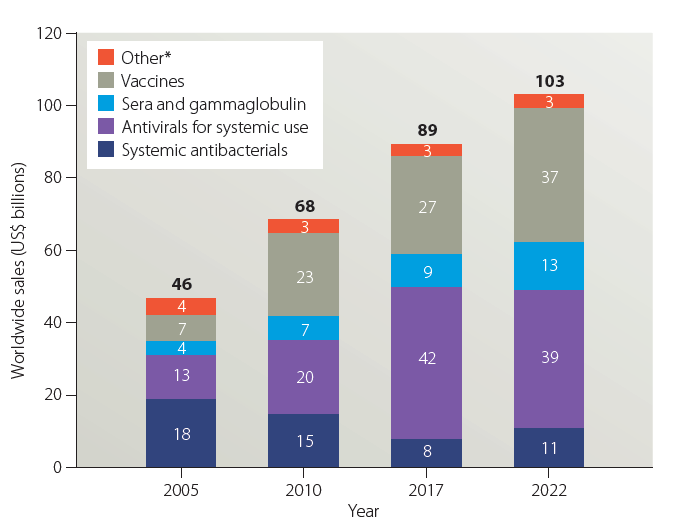 In particular, the antiviral market has doubled in size—from $20 billion in 2010 to $42 billion in 2017—driven by therapeutic paradigm shifts, especially in the hepa­titis C market (Fig .1). On the other hand, there has been a continued decline in the market for systemic antibacterial therapies, with annual revenues dropping from $15 billion in 2010 to $8 billion in 2017, owing to generic competition and limited pipeline innovation. 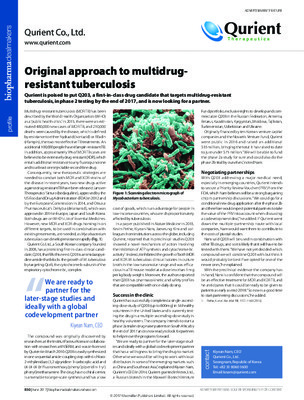 This trend has ultimately contributed to fuelling the political momentum and debate on antimicrobial resistance and raising the awareness on the need to incentivize innovation in antibiotic drug discovery and development. With a compounded annual growth rate (CAGR) of 3% from 2017– 2022, the infectious disease market is forecast to expand, but more slowly than the overall prescription drug market, for which a CAGR of 6% is expected in the same period. The HIV integrase inhibitor-based class—the leading growth driver—is expected to generate $7.2 billion in additional sales in 2022 compared with 2017, fuelled by Gilead’s (Biktarvy and Genvoya) and GlaxoSmithKline’s (Triumeq) combination therapies. The polyvalent immunoglobulin segment (Shire’s Gammagard and CSL’s Privigen) and pneumococcal vaccines (Pfizer’s Prevnar 13 and Merck & Co.’s Pneumovax) are expected to be the second and third largest therapeutic areas, with 2022 sales of $9.5 billion and $8 billion, respectively as shown in Fig. 2a. If we extend the analysis to the top ten growth drivers, sell-side consensus forecasts paint a positive outlook for the vaccine class as a whole, with six out of ten segments among the top ten (Fig. 2b). Within the antiviral segment, the decline of the hepatitis C virus (HCV) class is forecast to continue in light of the decreasing demand and intense price competition. The sensational performance of the 2014–2016 period is long gone and the size of the entire class is expected to fall to $6 billion in 2022 (Fig. 2b), down from $12.6 billon in 2017 (or a 75% reduction compared to the $24 billion peak in 2015 following the launch of Gilead’s Sovaldi and Harvoni). Despite the challenging commercial outlook, there is still room for innovation. In fact, AbbVie’s Mavyret—the first treatment of 8-week duration approved for all HCV genotypes 1–6 in adult patients without cirrhosis who have not been previously treated—is expected to take the lead, with a consensus forecast of $3 billion in 2022 according to Evaluate. Fig. 2 | Key therapy areas and products in the infectious diseases market. a, Top ten therapeutic classes in the infectious diseases area. The areas are ordered based on forecasted sales in 2022, and the three key products in each class in 2022 are shown on the right. Market growth is driven largely by antivirals. b, Growth drivers and brakes. 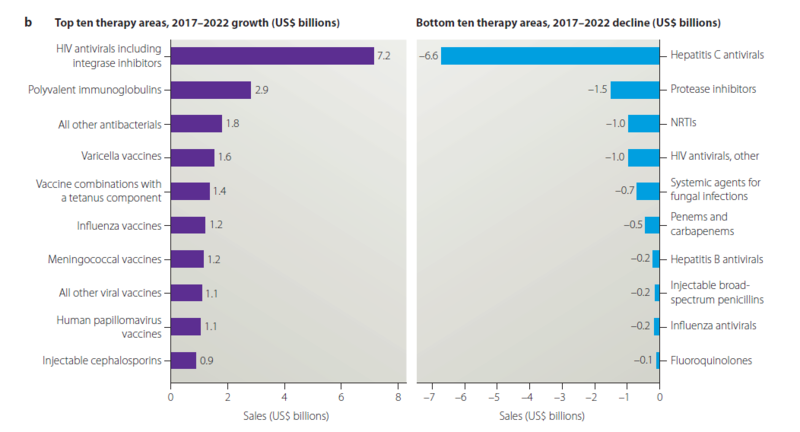 The top ten therapy areas ranked by growth and the bottom ten therapy areas ranked by decline, based on changes in sales between 2017 and forecasted sales in 2022. NRTIs, nucleoside and nucleotide reverse transcriptase inhibitors. Source: Evaluate, March 2018. A closer look at the early and late-stage pipeline broadly confirms the key commercial trends in the market. Figure 3 clearly shows how vaccines and antivirals take the lion’s share of all the development activities: 71% of all the phase 1 and 2 compounds and 60% of all phase 3 assets in pipeline are in one of those two classes. Emerging BioSolutions’ NuThrax (anthrax vaccine) tops the list of the best-selling research and development (R&D) products in 2022, with a sell-side consensus forecast of $870 million according to Evaluate. However, pockets of R&D activities are emerging in the broad systemic antibacterial area and, on a smaller scale, for antimalarial therapies (Box 1). Fig. 3 | Infectious diseases pipeline. 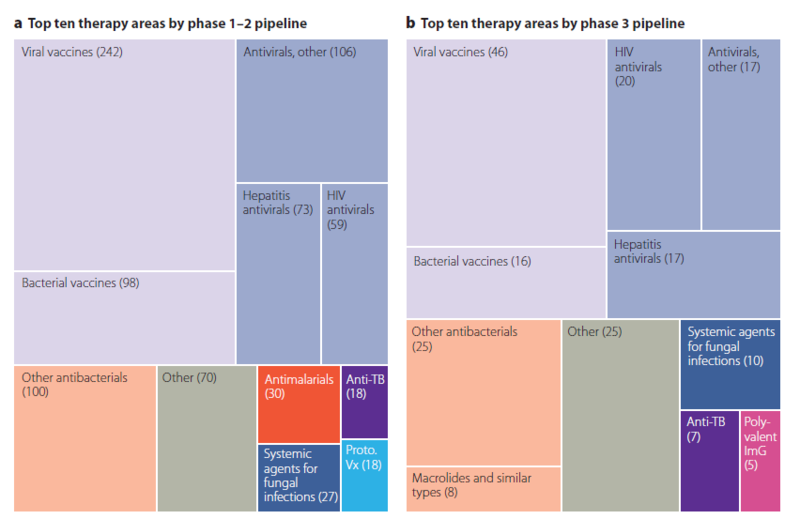 a, Top ten therapy areas in the early-stage (phase 1–2) pipeline (841 candidates). b, Top ten therapy areas in the late-stage (phase 3) pipeline (206 candidates). The pipeline includes potential new molecular entities, new derivatives and potential candidates for new drug applications. Generics, biosimilars or over-the-counter products have not been accounted for. ImG, immunoglobulin G; Proto. Vx, protozoal vaccines; TB, tuberculosis. Source: Evaluate, March 2018. 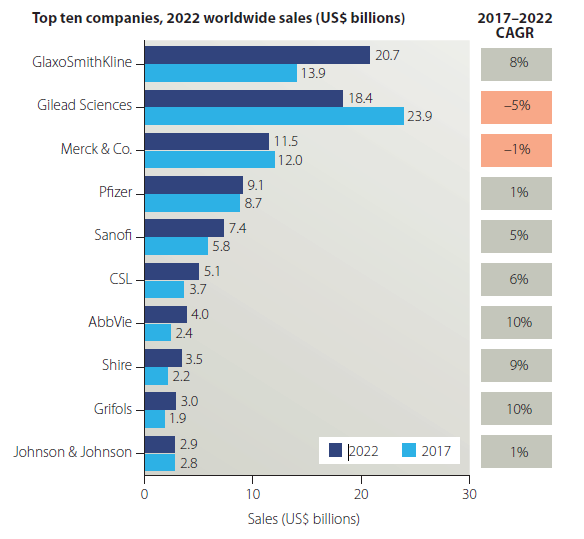 With Gilead losing ground due to the decline of its HCV franchise, GlaxoSmithKline (GSK) is set to emerge as the market leader in the infectious disease space with 2022 revenues of $20.7 billion (Fig. 4). The rosy outlook for GSK is the result of two high-performing com­mercial franchises (HIV and vaccines) and a series of focused invest­ments with the acquisitions of Novartis’s vaccine business in 2015 for $7.05 billion (an asset swap transaction in exchange for GSK’s oncology franchise) and Bristol-Myers Squibb’s HIV business in 2016 for up to $1.5 billion including potential milestones. Infectious diseases such as malaria and tuberculosis that have their highest prevalence outside of the main pharmaceutical markets continue to represent a major global health challenge. To address the lack of a conventional market for new therapies for such diseases, novel approaches to financing and conducting drug development have been pioneered, and partnerships have played a key role. 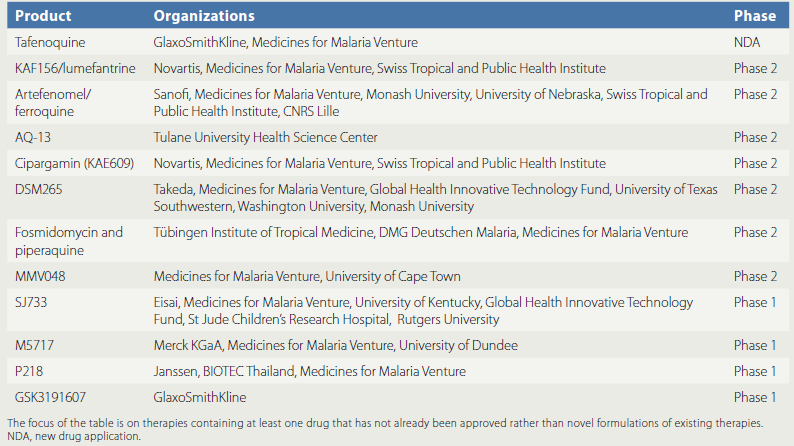 For example, product development partnerships such as the Medicines for Malaria Venture and the Drugs for Neglected Diseases initiative, which coordinate the efforts of partner companies and not-for-profit organizations, have revitalized the drug pipeline for diseases such as malaria in the past decade (see Table). Experience gained from such partnerships could also be valuable in other areas where market failures are a barrier to bring new drugs to market, such as development of new therapies for antibiotic-resistant infections. After GSK, Sanofi is one of the most active players. In March 2018, Sanofi and Evotec teamed up to set up an open innovation platform to accelerate research into the treatment of infectious diseases. Prior to that, Sanofi acquired Protein Sciences for $750 million in 2017 with the aim to strengthen its flu vaccine business with the addition of Flublok quadrivalent influenza vaccine. Additionally, Sanofi entered into an agreement with AstraZeneca to develop and commercial­ize MEDI8897, a potential next-generation respiratory syncytial virus (RSV) antibody. Further consolidation in this space is also signaled by Pfizer’s acquisition of AstraZeneca’s anti-infective business for $1.6 billion in 2016 and, prior to that, Merck’s $9.5 billion investment to acquire Cubist Pharmaceuticals to reinforce its presence in the anti­biotics space. Also among the large pharma companies, Johnson and Johnson’s Janssen unit has supplemented its promising early-stage pipeline (lumicitabine for RSV infections and pimodivir for influenza A virus infections) with a $879 million licensing deal with Bavarian Nordic in July 2017 to boost its R&D program for HIV and HBV. 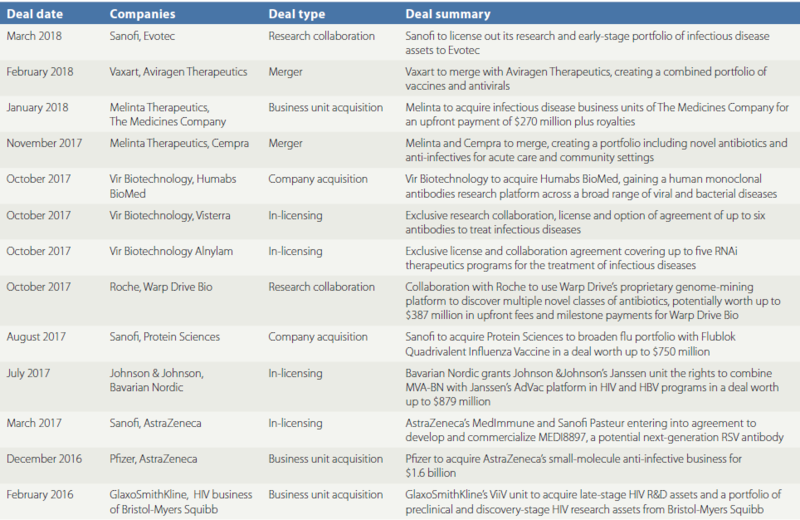 Beyond the large companies, emerging players such as Melinta Therapeutics and Vir Biotechnology have also been making deals (Table 1). Melinta Therapeutics, after merging with Cempra in November 2017, completed the acquisition of The Medicines Company anti-infective business in January 2018 with an upfront payment of $270 million plus royalties. Vir Biotechnology, which is headed by Biogen’s former CEO, George Scangos, was set up in 2017. In its first year, it concluded multiple deals to build its R&D capabilities in the infectious disease space, including the acquisition of Humabs BioMed, two research partnerships with Visterra and Alnylam and multiple collaborations with leading academic centers such as Stanford and Harvard University. Deals are from the period January 2016 to March 2018. 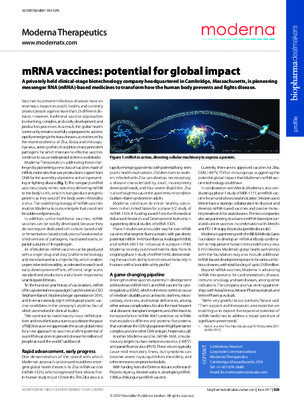 HBV, hepatitis B virus; R&D, research and development; RNAi, RNA interference; RSV, respiratory syncytial virus. Source: Evaluate. Fig. 4 | Top ten companies in the infectious diseases area. 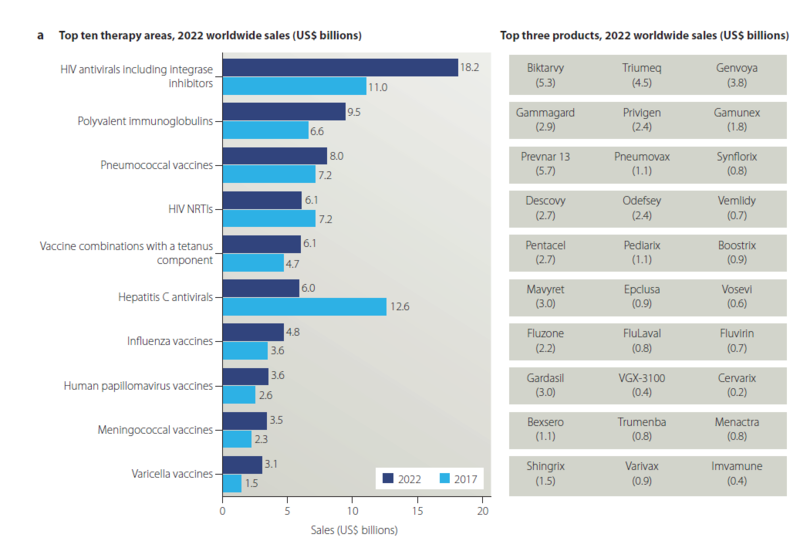 Companies are ranked based on forecasted worldwide sales of products in the infectious diseases area in 2022. CAGR, compounded annual growth rate. Source: Evaluate, March 2018. Antonio Iervolino is Head of Product Strategy at Evaluate Ltd.